Gui, Add, Edit, x52 y100 w120 h20 +Left vArtist +Limit30, % Artist ? Artist : "Artist Name"
I think I'll leave it as is, for now. It looks like something to do with using variable names more than once. This script is getting both shorter and better at the same time! Now, let's dig in a little. All the low hanging apples have been picked. I will sit down and spend some serious time following the script, and give my advice. The first piece is Gui, Default. It shouldn't melt your brain at all! Gui, 2: Add, Edit, vEdit, Hello! ; The above is the same as the below in functionality. Gui, Add, Edit, vEdit, Hello! The next item is organization. You are doing fairly well. However, I notice some inconsistencies. Inconsistencies are fine in small scripts. However, in a large script, they can be frustrating once a bug pops up. I lied! there is a low hanging apple! This is because you are 'returning' whether or not it exists. MenuViewVersionHistory is the same way. Also, please consider using 'Else' instead of opposing If* commands, as it is more clear at a glance. Also, the if* commands are deprecated, and will not be included in AHKv2. Instead, I prefer to use If FileExist() instead of IfExist. This is up to you, but I strongly suggest a switch. 2. A Function, by its nature, returns a value (it does the "math") and a Subroutine, by its nature, changes stuff around (they don't do calculations or values). I see the purism that can be applied here, and I've changed two functions back into subroutines. 4. When you say that 'If*' commands are deprecated, does that mean statements like: "If bla bla bla" (with a space after the 'if') or ones like "IfExist bla bla" (without a space after the 'if')? In any case, I'm unable to determine which 'If' statements are the opposing ones and if they should be changed. There's the three 'If's in the section that determines if system is 32 or 64-bit but I don't see how those can be altered. I tried putting an "Else" on line 143 in place of "If (arc = 6)..." but it makes errors. Very appreciative of the progress you've helped me achieve, nimda, I've given you credits for your help, in the version history, if that's ok with you. The only time you should ever escape quotes is in an expression, and there you do it by doubling the quote. You have many lines like this; try ctrl+f and search for `"
When you say that 'If*' commands are deprecated, does that mean statements like: "If bla bla bla" (with a space after the 'if') or ones like "IfExist bla bla" (without a space after the 'if')? In any case, I'm unable to determine which 'If' statements are the opposing ones and if they should be changed. There's the three 'If's in the section that determines if system is 32 or 64-bit but I don't see how those can be altered. I tried putting an "Else" on line 143 in place of "If (arc = 6)..." but it makes errors. Now, the If* commands. These are things like IfExist, IfWinActive, etc. They are deprecated, and can easily be switched for If FileExist() and If WinActive(). Opposing If's are generally any two statements which are logically not equivalent, like If x=1 and If x=2. ; The error here is that although it seems logical, '2' will NEVER be sent. Lots of green text in this post! ...yet it works correctly without escaping, like you said. All instances of escaped quotation marks are now non-escaped. ; Function to remove duplicate quotation marks (by nimda)-----------------------------------------------------!! It sure tidies up that section of the script. Why didn't I think of this? This appears to make an apple hang lower on the tree, but that is ok since now it is a very good quality apple and not about to go rotten anytime soon. EDIT June 2nd: Very strange behavior with the ToolTip text on the Info and Exit buttons... the ToolTip will stop appearing after clicking a few buttons and opening a few menus. And it does not ever come back, until the script is reloaded. Then everything is fine again for a while but inevitably the problem returns. It is strange because no other controls lose their ToolTips at all, at any time. If I open the script from Scite or if I open the compiled EXE, the problem happens. The only time it does not happen is when the actual AHK script is run. Then I cannot reproduce it. I think the ToolTip problem might be with the message GUIs being created and destroyed. I tested by replacing one with a plain MsgBox and it would not trigger the problem. I narrowed it down even further by removing the "fade" function from the message GUIs with no change. I also tried removing the Gui, Default commands in case switching default windows was causing it, but it wasn't. Until now, it has been fairly easy going. Now, you have a bug. You are finding it hard to reproduce the bug. In fact, you have no idea if it's a bug with AutoHotkey, someone's function, or your script. This will truly be a challenge, and a learning experience. You must look into your code from the outside, not saying "oh, this does that" but instead saying "I think this will do that by causing these actions." ... so you should be using listvars. I hope you look on this as a challenge, and continue until you hit that 'DOH! That's why! (now, how do I fix it?)' stage. Thanks for posting your program. It doesn't seem to function with my Sonar 3. There were no errors in your program, but within Sonar 3 there is no sign of new export options in the export menu. Which operating system are you on? Which edition of Sonar 3? I'm not sure why they are not showing up for you... but I've got Sonar 3 PE tucked away somewhere which I can install later today, and I will check it out. Did you try restarting Sonar and then checking for the new entries? Cakewalk has used the "HKEY_CLASSES_ROOT\CakewalkExtAudioEncoders" location for these entries since the dawn of time, I'm very curious why it is not working for you. EDIT: I have access to Sonar 4 Producer Edition, that's the oldest one I have. My buddy still has Sonar XL and reports no problems on XP. It may be something to do with not having an Administrator level account...? and it has not happened since. I am Using Sonar Producer 3.0 with Windows XP pro. Yes I did restart Sonar. I also uninstalled and then re-installed the MP3 patch using your program. I also tried restarting the computer, re-running Sonar & saying a prayer. None of which solved the problem. Let me know if you need further info. ...ok let's check the location the patch writes entries to. 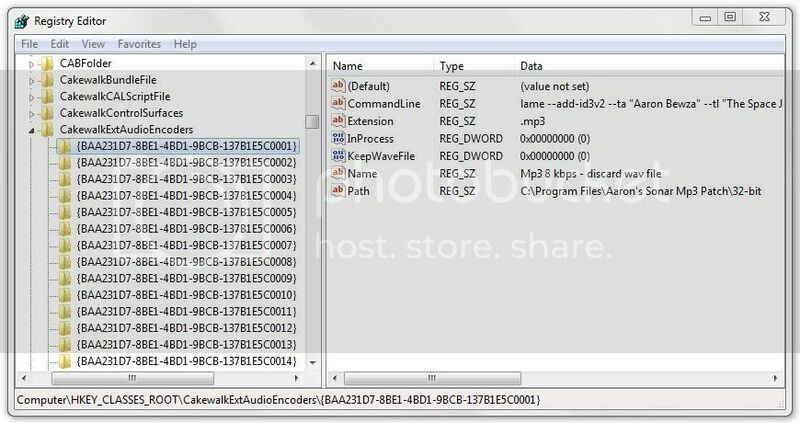 - in the "path" box, type the full location of the encoder (C:\Program Files\Aaron's Sonar Mp3 Patch\32-bit\lame.exe usually, or use the "browse" button to find it). 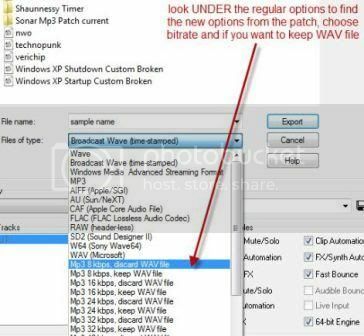 ...try looking for that entry in the Export Audio box under file type. If it is not there, something is buggy with the way your Sonar configures an external encoder. If that's the case, I would suggest an upgrade to at least Sonar 6 for your XP, it's way more of a program but isn't a huge resource hog. Your problem seems to be unique, but my curiosity is stoked and I'm wanting to know what's up with it too.